I can tell it's time to do this because the thought of doing it, the butterfly-y/fluttery feeling that stirs my insides every time I consider doing it doesn't seem to be going away. It feels scary/out of my comfort zone/exciting/stretchy/intimidating. Did I mention scary? I keep wanting to put it off 'till later, I keep trying to find excuses for why this isn't a good time. My mind is saying things like--what if you can't do this every day? What if you disappoint yourself/others? How will you squeeze it in this week when the kids are off school for three days? Haven't you done enough 41 day things? But here's what I say every time I do one of these 41 day things--when I commit here, when I declare aloud/set intentions/get clear....things happen. I actually follow through, I learn new things, I get out of my comfort zone and all kinds of beautifully unexpected, expansive things happen. And as much as I've tried to ignore/shake this idea, it doesn't seem to want to leave me alone. There is something deeper/something beyond my rational/scared mind that is trying to get my attention. I decided to take this as a sign. To bring my book of poetry/art into the world. I decided to focus on these two desires because, even though I absolutely love to paint & and even though I so want to bring my book of poetry/art out into the world, for some reason(fear), I continually resist sitting down and just beginning. I find that the more time I put these things off, the more the resistance/fear builds. So, for 41 days I will dedicate a minimum of fifteen minutes a day to creative play. My focus will be fully on the process of creating, not the product. The idea is to get OUT OF THE WAY and allow whatever wants to come through to come through, to enter the present moment & allow intuition to be my guide. No rules. No expectations. No mistakes. I will be primarily focusing on painting & drawing (though this kind of spontaneous expression can be applied to any form of creation). In addition to the 15 minutes of creative play, I will dedicate a minimum of 15 minutes to creating my book of poetry/art. I will do my best to simply show up with the intention of separating the creator and the editor. I will do my best to listen to what wants to come through me. I'm choosing 15 minutes because it seems doable and, typically, it's the getting myself to sit down and begin that's the greatest challenge. Often, once I sit down and get started, flow starts to happen and I stay put for much longer than the allotted time. What would I create if I couldn't screw up? What would I create if I/it didn't have to be good? What would I create if I weren't worried about what others would think? What would I create if I fully trusted in the process? It is clear to me that I'm not interesting in painting/writing/creating a book for the sake of being "good" or "successful" (in the money making/status kind of way). I'm interested in painting/writing/creating a book because it brings me closer to spirit/God/Love/freedom/empowerment. It is my hope that in sharing this process with you, you will be inspired to do the same. This is where my heart is calling me. I will plan on writing about this here (everything is so much more fun when shared with you beauties), though, my online time will most likely be less as I focus on my own creations. I have heard that the new moon is a great time to set intentions (so that the energy of nature can help them to unfold and expand) and it just so happens that tomorrow is the new moon. So, tomorrow I will begin. Okay, I've put this off long enough...I'm going to push "publish post" now. Here we go! Wanna play along with me? I think this is going to be fun! Okay, Julia! I have this stirring within, those butterflies you are feeling of excitement in my belly as I read your words! I think I am meeting you at this exact place in time. Fiona told me today that she encouraged me to just go for it. For what, I don't know! but then I come here, and voila, more holding the space for birthing my creations. I love how you set up a loving, do-able structure. I know that you will be held and witnessed to in this space, and that your heart will not only become closer to Source, but that you will feel yourself as One. You are precious, my friend. I celebrate you! How compelling! I keep coming back and re-reading this. Thank you for the nudge and for sharing all you do here. Julia - your posts are always so heartfelt - love what you have said here! amazing! 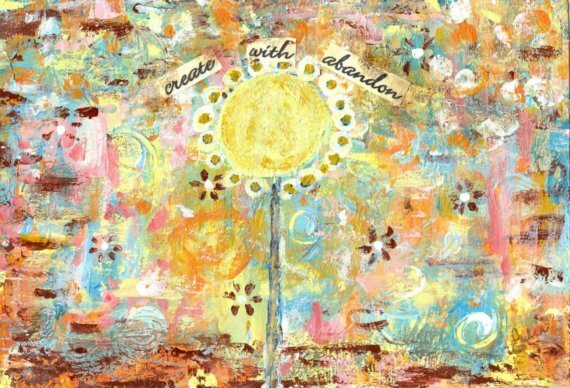 the new moon is today and this journey calls to me also as I have been really trying to paint with more freedom and playfulness and NO JUDGEMENT!!! i would love to join the fun with you and your readers! i too have been wanting to try something scary - start a blog/website focussing on my art journey...I finally took a leap and set the template up a few weeks ago, then had two craft shows and ignored the blog....now I feel like I need to commit....15 minutes a day seems doable....i will do either playful creation (art, photos, crafts, dance) or some creative blog play each day. better give you my blog url to keep myself honest! thank you for the gentle and supportive inspiration!!! You're going to rock this, my friend! I'm excited to watch the journey unfold. Being 27 days into the 'Screw Work, Let's PLAY' 30 day challenge, I feel electrified reading your exquisite words. I cannot wait to see what unfolds for you. For myself, I have a desire to continue to play (and an ever-increasing urge to paint, something I haven't done since I was a babe), and yet a very clear need to focus on my finances as I'm in a tough situation right now. So I shall be continuing to spend 15-20 minutes in a state of play each day, and see what emerges. Yikes indeed! Your book... oh, your book. I love this birthing process, and I love you. Julia, I can't wait to see what you do! This is going to push you forward into that creative place where nothing exists but the real. What a beautiful commitment...the fruit will be delicious! I can't recall how I found your blog, but am so enjoying catching up on your 41 days. It isn't an accident that I'm finding words that comfort and encourage me right where I'm at...but also tempt of a place I want to go. Thank you for the questions in this post...what would I do if... Thank you for sharing your creativity!